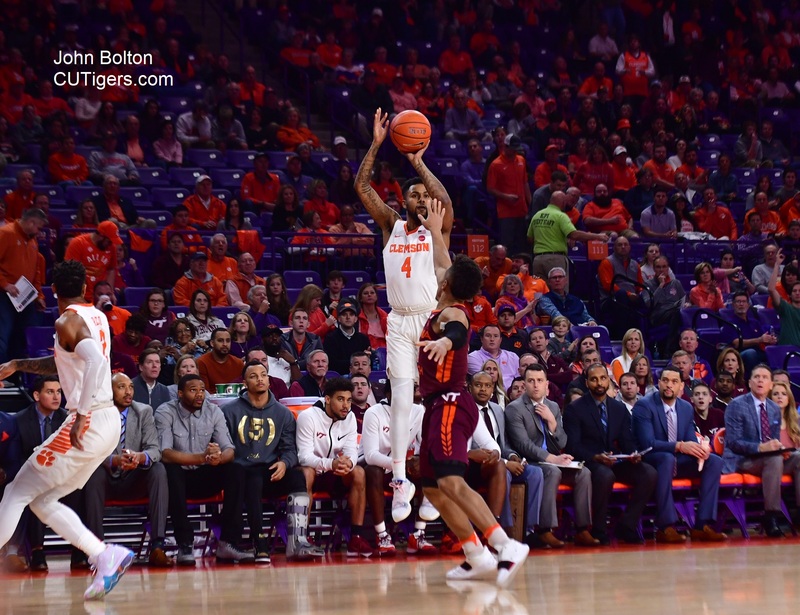 CLEMSON, SC - Two weeks ago today, the morale of the Tigers had to be at an all-time low after a devastating buzzer-beater loss at No.21 NC State--a game they had all but won in the last minute. That dropped the Tigers to 1-5 in the ACC after a brutal stretch of opponents to open the conference schedule. I said after the loss that I still believed this team was good enough to make it back to the NCAA Tournament, but they would have to put the loss behind them and bounce back quickly. They did exactly that. The Tigers picked up their biggest win of the season in front of a great Littlejohn crowd on Saturday, beating No.11 Virginia Tech 59-51 to improve to 15-8 overall. It was the fourth straight win for the Tigers, who are now 5-5 in the ACC! They have allowed just 43 points per game in the last 3, and Eli Thomas has 19 blocks in those 3 games. Even more impressively, he has played just 69 minutes in those 3 games, so he's averaging a block every three and a half minutes over that stretch! Shelton Mitchell had a sensational first half, going 6-7 for 18 points with five 3's and a 4-point play, and finished with 22 points. Leading scorer Marcquise Reed only scored 5 points in the first half and 15 in the game, so Mitchell's big game was just what the Tigers needed. Mitchell has been up and down this season but usually shoots well in Littlejohn. Things looked dicey for a while in the second half when both Eli Thomas and Aamir Simms were on the bench with 4 fouls apiece and over 8 minutes to play. However, the Tigers got a big 3-pointer from David Skara and some unlikely points from freshman Hunter Tyson, who had a pretty baseline reverse layup just before halftime and a clutch 3-pointer late in the game to put the Tigers up by 7. If FSU loses to No. 16 Louisville today, the Tigers will be tied for 7th place with the Noles, who they play in Littlejohn in 10 days. The Tigers have a very winnable road game next on Wednesday against a decimated Miami team, followed by a tough road game at No.16 Louisville next Saturday. The Tigers are riding high right now, and not many would have predicted that they could be 6-5 in the ACC and knocking on the door of the rankings with a win at Miami this week! Post-game interviews with Brownell, Mitchell and Buzz Williams are below, followed by highlights.